The First Hotel Kong Frederik Copenhagen is situated near Stroget, Town Hall Square and Tivoli Gardens. The fair grounds are only 8 kilometers away from the hotel, while the convention center is 10 kilometers away. Restaurants are available within the local area near the hotel. There are also many shopping opportunities not far from the hotel property. Guests will also have easy access to a choice of entertainment venues in the local vicinity. 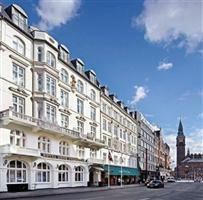 The Central Station is only a short distance from the First Hotel Kong Frederik Copenhagen. The airport is also located within an 8 kilometer drive of the hotel. Public transportation makes it easy to access the hotel and get around to see the sights. There are 110 guestrooms at the First Hotel Kong Frederik Copenhagen. Each room offers satellite TV, private baths, ironing sets, hair dryers, work desks, daily newspapers and mini-bars. All guestrooms are non-smoking. Amenities available at the First Hotel Kong Frederik Copenhagen include a breakfast buffet, meeting rooms, Internet access, shops, bar/pub, laundry and dry cleaning services, spa, gym, 24 hour room service and complimentary newspapers.